No prizes for who couldn’t resist! What a treat a four day holiday is. 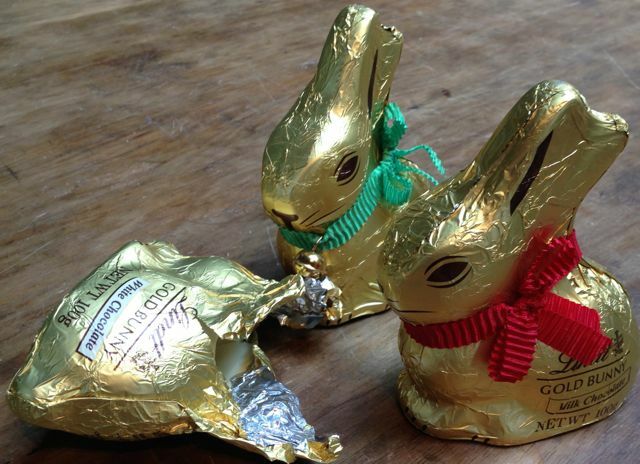 I admit to not celebrating Easter in either a religious or over the top chocolate way, but do enjoy the break from a busy working life. At the beginning of the break four days seems to stretch out and be almost infinite. By the fourth day I usually wonder where all the time went. Today is that fourth day. On the eve of Good Friday I did the usual supermarketing and brought home the latest Taste magazine (the NZ version). 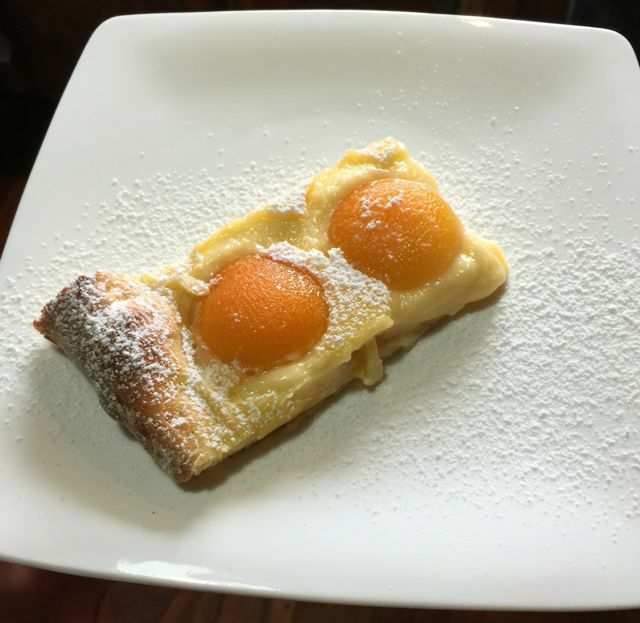 On Friday morning I promised myself that I would cook the Apricot, Custard and Brioche slice. It’s now Monday morning and, yay, it’s cooked and tasted. And how glad am I that I made it. Delicious. So, here is the recipe and a few photos. It wasn’t difficult, a bit time-consuming, but, hey, that’s what holidays are for. Put the dough ingredients in the pan of the bread-maker in the order required by your bread maker. Set the machine to dough only setting and turn on. When the dough is made and rested, preheat the oven to 170 C fanbake (190 C standard) and place the rack just below the centre. Heat the milk in a saucepan. Stir together the creme fraiche, cornflour, sugar, egg yolks and vanilla to make a smooth paste. Whisk into the hot milk, and continue to whisk until the mixture thickens. Cover with a lid and set aside. Roll the dough out to 1cm thick and place on a shallow-edged tray lined with baking paper. My dough was Very Sticky – and I was SO worried that it was all wrong. I perservered but found it difficult to roll and place on the tray. I also just used a plain old baking tray and made sure the edges of the dough were built up. The dough needs to be 1cm thick. Leave for about 10 minutes, as once rolled it shrinks a little. Spread the cooled custard on top, spreading evenly. 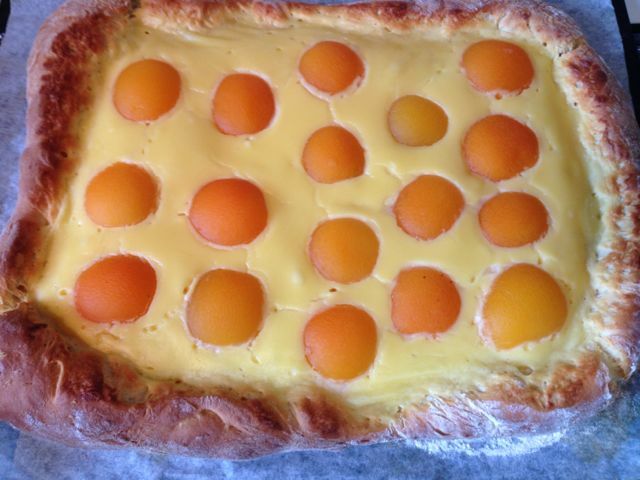 Sit the apricots in the custard either cut-side or rounded side up. Bake in the preheated oven for 25-30 minutes until the dough is well cooked. It will be brown around the edges, but you need to make sure the centre is cooked. Sprinkle with icing sugar before serving. Serve warm with vanilla ice-cream – though we just ate it as is and loved it.